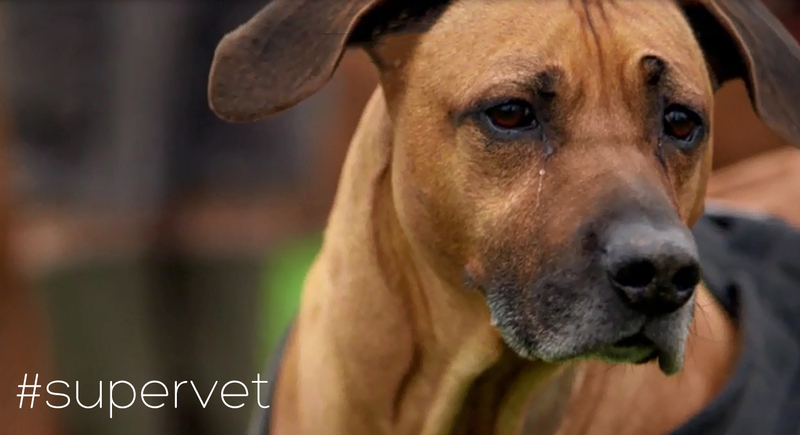 Ella and Rob took Louis, their seven-year old Rhodesian Ridgeback to the vet after they thought he had fractured his leg, but were shocked to learn that he had a cancerous tumour which was spreading fast; so fast that they thought he would not last the weekend. Louis’ condition is especially poignant for Ella who herself has suffered with a brain tumour and as a result lost sight in one eye. 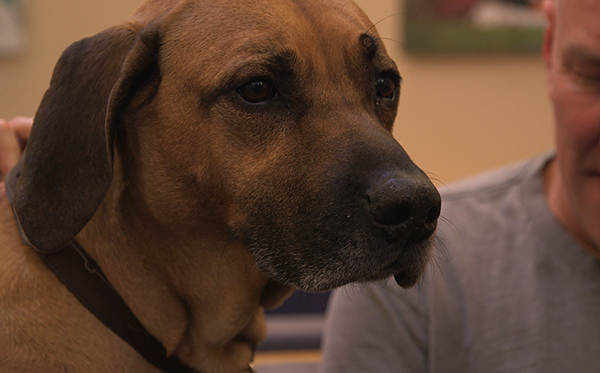 The couple bring Louis to Professor Noel Fitzpatrick, to see if surgery might save his leg, and prolong his life. The couple wanted to give Louis the best chance possible, but before Noel could discuss with them the options, he and his team needed to establish whether the cancer had spread to other areas in the body that could be a cause for further concern. The scans did not show any signs of secondary tumours and the family were able to turn their attention to what they wanted to do about the primary tumour in his leg. The family had three options, carry on with radiation therapy and keep him comfortable, take the leg off entirely or remove the cancerous bone and replace it with an endoprosthesis. After careful consideration of what was best for Louis, Ella and Rob decided that they didn’t want to give up hope, and they asked Noel to proceed with implanting the endoprosthesis. The prosthesis had to be specifically made for Louis based on his CT scan so they took Louis home while they waited for it to be made. In order to save the leg, Noel performed a surgical procedure whereby the cancerous bone was cut out and replaced with a specially designed complex network of interlocking implants making one unit – an endoprosthesis. The endoprosthesis completely replaced the section of bone that needed to be removed and bridged the gap between the top and bottom of the shin bone (tibia) to allow normal weight bearing. The ankle (Hock) was fused in the process. 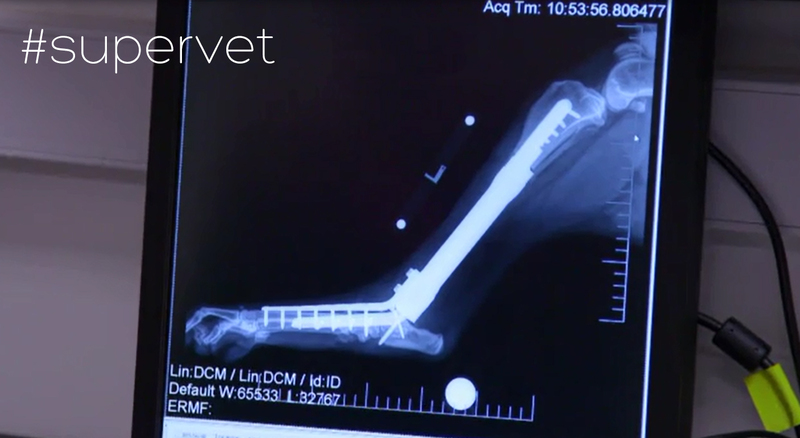 Fitzpatrick Referrals utilises special manufacturing techniques to allow the patient’s own bone to become incorporated into the implant over time. The team has used this technology for the management of bone cancer in dogs with great success over several years. Early comfortable use of the limb is typical with patients returning to near normal exercise routines after the recovery period. Noel began by cutting out the cancerous tumour. In Louis’ case, 73% of his tibia. Noel and the team had to be vigilant throughout to ensure no cancerous cells were left behind or had spread, though it’s impossible to be certain about this. When the cancerous portion of bone has been removed, Noel replaced the bone with the specially made implant and The single biggest challenge was to maintain enough blood supply to keep the foot alive and enable to implant to fuse with Louis’ body. 4 hours later, the incredible surgery is complete, and Louis’s post-operative images were encouraging. Remarkably, Louis was standing up just 18 hours after the operation, but his first 8 weeks were critical. Any infection or swelling and he might have lost the fight to keep his leg. 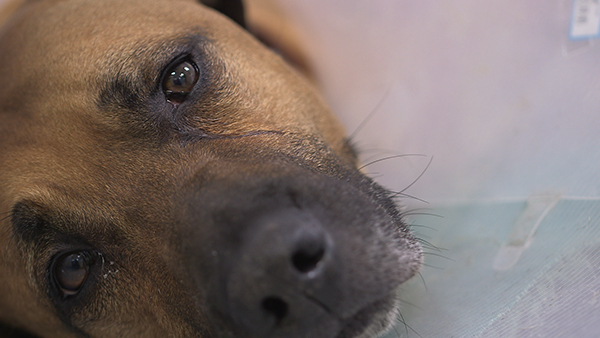 Rob and Ella are devoted to Louis, so to give him the best fighting chance they lived apart to keep him away from the other dogs whilst he was healing. Their hard work paid off. Six weeks later imaging showed that bone was growing onto the implant, and even more good news was that the cancer hadn’t spread! Louis went on to have sessions of chemotherapy to try to slow down the chances of the cancer returning. To Ella and Rob it is all worth it, as they already feel their dog has been saved and are looking forward to as long as they have with him.